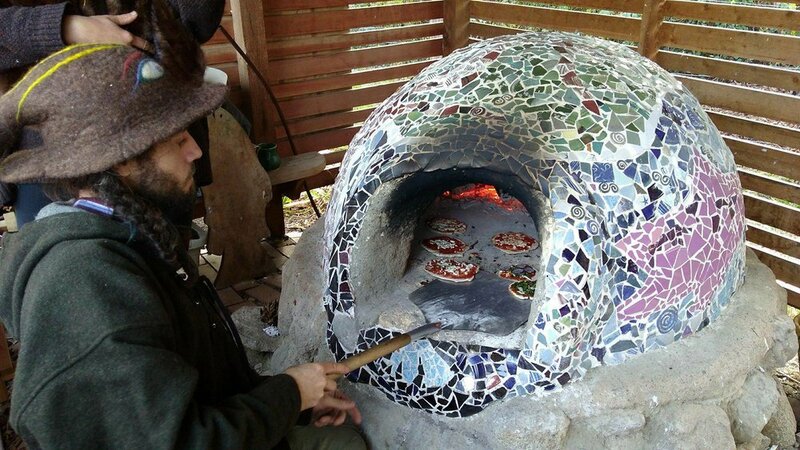 Autumn Celebration, October 2017: To celebrate the season, we partnered with James from Soul Flour Bakery & Roaming Hearth Pizza to cook up over 80 pizzas in the cob oven. Many of our friends wore costumes as they decorated their own pizza with garden fresh ingredients and created art prints with local apples. Soil donation from San Juan Sanitation, September 2017: To ensure our late fall crops would have the necessary nutrients to thrive throughout the season, San Juan Sanitation donated and delivered another batch of top soil. It took two full days of class to distribute the soil to the garden beds. Students wore big smiles as they worked to complete the task. Woodchip donation from Rich Harvey, September 2017: Thanks to Rich Harvey of Harvey Logging, LLC, we received a truckload of wood chips to have our garden shine on the day of the annual Orcas Island Farm Tour! Over 180 elementary students worked together to spread the woodchips throughout our garden pathways. Garden club mini-tour, May 2017: Our garden keeper Colleen hosted a tour for a small group of Orcas Island Garden Club members. The garden club has been a notable supporter of our program for several years! It was through their grant awarding this April our vision for a native plant site became a reality. It was a pleasure to wander the garden together sharing plant knowledge and laughter. Native plant site designed by Master Gardeners and funded by a grant from the Orcas Island Garden Club, May 2017: We were awarded a grant to create a native plant site in our garden for our students, community members, and local pollinators to enjoy! We partnered with a dedicated group of Master Gardeners in San Juan County and made this vision a reality. Click here to read more about the new native plant site. Woodchips from San Juan County Road Crew, April 2017: Each year we receive woodchips to (re)create walking paths and keep weeds at bay. Moving the woodchips together as a class acts as a practice in patience, problem solving, perseverance and teamwork. Soil from San Juan Sanitation, March 2017: Our friends at San Juan Sanitation delivered six yards of soil for the growing season. After a long, cold winter, our garden beds were ready to be turned for new plantings. Students moved soil with wheelbarrows, shovels, buckets and hands. After two days and 200 students helping in the process...we're ready for spring! Halloween in the Garden, October 2016: Our first annual Halloween in the Garden was a success! The combination of Polaroid pictures, hot pizza, costumes and lots of smiles made this party a blast. Click here to read more about the celebration. Orcas Island Farm Tour, October 2016: We were lucky enough to participate in the 2016 Orcas Island Farm Tour. The garden looked much different at this time of the year, than it had during the Annual Orcas Garden Tour. This time around, friends of the garden saw beds full of beets, squash, kale, medicinal herbs, tomatoes, potato leaves, onion and leek starts, and the last of the summer flowers. Oh, and of course, there was plenty of student art for all to enjoy. Read more about the Farm Tour by clicking here. Calendula Salve Making in the Garden, July 2016: While waiting for our salves to set, we turned to a large bed of calendula flowers for inspiration. We identified and discussed the assortment of calendula flowers used in the salves. We hand picked seeds from the dried flowers to fill seed packets. And a few of us harvested the blooming yellow and orange flowers (along with bright pink Echinacea flowers) to assemble flower crowns. Click here to read more! Indigo Workshop in the Garden, July 2016: Our incredible garden keeper, Colleen Stewart, led a Shibori workshop in which friends of the garden played with indigo dye and their imagination to create astonishing blue and white patterns on decorative flags and tee-shirts. Click here to read more about the workshop! Orcas Island Garden Club Annual Garden Tour, June 2016: Among the many beautiful gardens here on Orcas Island, our school garden was selected by the Orcas Island Garden Club, to be on their annual summer garden tour. This was such a treat for us because the garden club has been a huge supporter of the school garden! Click here to read more about the garden tour! Building of the garden greenhouse begins, March 2015: Thank you Colleen Stewart and Ryan Morris for the time you dedicated to building this beautiful structure. Thank you to John Stewart of Maple Rock Farm, Shannon Belthor, Orcas Island Garden Club, Tom Berg and Carol Marcin for making this greenhouse possible! Perennial prep and pizza party, August 2015: THANK YOU to our volunteers. We got a lot of work done... prepping the bed for winter cover and eventual flowering perennials, and cutting back blackberries. This garden would not be possible without all the community care. See more images in our blog! School garden goes to the Farmer's Market, July 2015. See more images in our Blog! Mural in the garden painted by our 6th grade students and Brook Meinhardt, May 2015. Completion of the school garden gate: Two years in the making, our garden gate received its crowning touch in May, 2015--two metal arches with dangling leaves that students have been forging over the past two years with local blacksmith Jorgen Harle. We are so thankful for his guidance and artistry. Also, a big thank you to 7th grade student Ewan who heated, hammered, and installed at each of the past four wrap-up sessions. Chelsea Cates has been our school garden keeper for the past five years. She is moving on to hike the Pacific Crest Trail and then go on to further her education. Filling her well-worn garden boots is Colleen Stewart. Though we will miss Chelsea so much, Colleen is excited as we are to take over our garden where Chelsea left off. Read all about them both by clicking here. Chelsea says "bye" while Colleen gets ready to work! Building of a 3-bin compost, April 2014: Thanks to the Orcas Island Garden Club who gave our school garden a wonderful $500 grant recently, we have a beautiful new 3-bin composter for the garden! It was built by Tom Gossett, a master woodworker, who has also been extremely helpful building our garden fence, gates and other garden projects. Are we fortunate or what!!! Thanks Orcas Island Garden Club and thank Tom!! We have expanded our garden from 2500 sf to about 8000 sf over the past couple of years!